Our Southern Director and learning consultant Sam Flatman, met with Millhouse School’s Headteacher Gareth Allen, to discuss big development projects to both the playground and early years outdoor learning environment. firstly, both Sam and Gareth agreed that an adventure playground would be a fantastic way to further promote a healthy and active lifestyle and that it should be located by their popular fielded area. 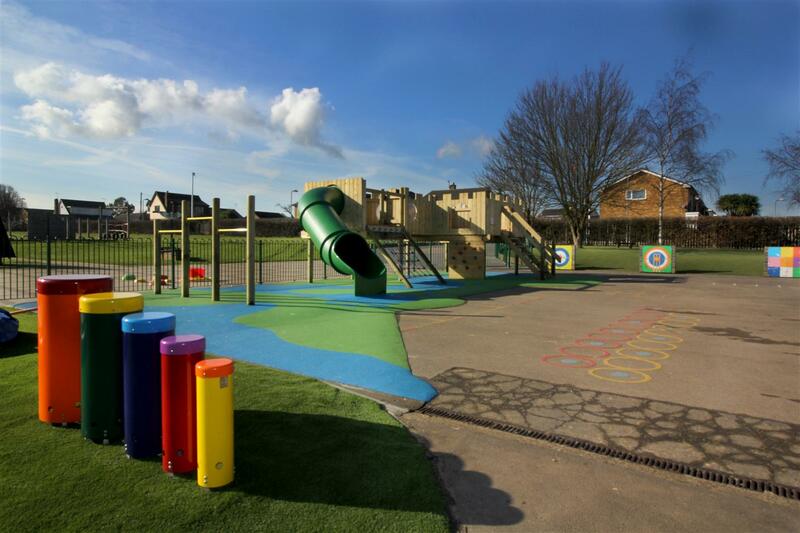 The whole project was spanned over two phases and the outcome is a fantastic zone for active play, collaboration and teamwork. We wanted to give the children variation in their play and plenty of active challenges that they could self-select from and access from all angles. The whole area had to promote team work, safe risk taking, physical development, communication and gross motor skills. Great Gable Climber with Rope Walk – an exciting and fun climbing frame that has numerous access and exit points to make the play experience more free-flowing. Great for improving strength, confidence and interpersonal skills. Log and Net Climber – a steeping vertical challenge that will help both the strength and movement of the children’s lower body muscles. Giant Spider’s Web – great for inspiring creative play activities and testing skills such as balance. After the first phase was completed, we then decided to add an exciting adventure trail full of exciting obstacles to add even more variation and fun. One great feature of the trail, is our Double Sided Timber Climbing Wall which is great for improving children’s strength and flexibility. As they create their own pathway from the coloured hand holds, children will strengthen their fingers and develop fine motor skills. Due to it being double sided, children can climb the wall and race each other together at the same time. To focus on balance and core stability, we installed our:Spring Plank, Tightrope Bridge and Wobble Bridge. For body and arm strength, we installed our Monkey Bars and Trapeze Swing. These are great additions, not only for upper body, hand strength and coordination but for introducing topics about momentum. To link all of these resources we installed our Rubber Stepping Logs which help children to move from one obstacle to the other safely, whilst developing their foot placement and stability. To create a safe environment, we re-surfaced the area with our Earth blend Playbond which will protect the children from falls and encourage them to take safe risks. A new child-led Early Years Environment... Who will conquer the Castle? Our other huge project at Millhouse Infant School, was our development of their Infant and Nursery Area, so that it provided more imaginative play opportunities to inspire the children. 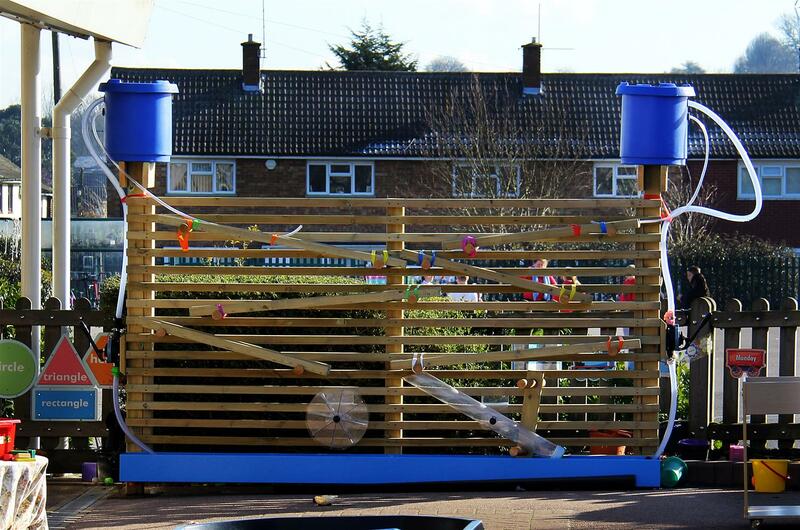 The biggest addition to the early year’s playground was our Langley Play Castle. This is a great imaginative resource that will inspire pretend play games; once they have slayed the dragon they must return to the castle to rest. While they are running, climbing and sliding around their castle in their imaginative worlds, they will be challenging and developing a range of key skills and working on strengthening their upper and lower body muscles. There are plenty of den-making opportunities under the castle for children to enjoy. Teachers can set fun den activities and give children materials to create their own special home. Taking groups of children to the top of the castle, provides the perfect environment for child-led games as well as being a great mystic area for storytelling and reading… a great way to bring stories to life. We surfaced the castle area with multi-coloured Wetpour surfacing which includes a river running underneath it to further fuel imaginative games. "The children love looking through the portholes and it gives them a new perspective of the world around them.The children just love playing on it". A separate zone was created away from the castle that focused wholly on creative and imaginative play. We surfaced the area with our natural looking Playturf and installed our Xylophone and African Drums to promote the use of music in an outdoors. Music helps relieve stress and will focus children’s minds and give them a calm feeling. White board - a place to practise writing and drawing outdoors. Outdoor Performance Stage – children will be able to express themselves and improve their spoken language, self-confidence and PSED. Play House – the perfect open-ended resource full of role play opportunities. From a Travel Agents to Police Station, children can transform their house into anything. The school now has their very own Gazebo which provides a sheltered area for teaching outside. This particular outdoor classroom can hold a full of class of children and offer extra inspiration to help children learn about certain topics. It can transform into a lively area when hosting debating sessions or can become a much quieter place for private one to one learning or reflection from a hectic day at school. Wigwams – a fun den-making resource that can be used to link historic topics. Playhouse with Seats & Chalkboard – create a Vets and ask the children to bring a toy animal in to introduce them to concepts of empathy. Shop Panel – Great for play activities! What type of shop is it today? Driving panel – there is a brand new group of F1 drivers on the scene… The Millhouse racers can’t stop winning. This zone will develop children's communication and language, PSED and their understanding of the world. Dig Pit – The Recipe says we need 4 handfuls of Mud, can anyone at the Dig pit help? Rope and Pulley – Load up the mud and transfer it to the kitchen! Mud Kitchen - Let’s get cooking, What Mud treats do you fancy? The area also included a Bug Hotel for children to investigate and discover new creepy crawlies for examination. As an additional, our Tunnel with Ramp Over was added so that children can look over the messy play zone form a distance. To give their reception children investigative learning opportunities, we added our fantastic Water Wall. This is a great outdoor resource that can help teachers introduce topics such as the water cycle, source to mouth and flow and gravity.